Friday's Evening Meal / Last Minute Bookings for all of the Long Weekend. American Contras, Danced in B'ham on Sundays. 2pm-5.45. Main Venue: Elmdon Heath CC Hall B91 2SF Near M42 J5 Click HERE for Website. Plenty happens, but generally a more quiet day - The Monday page. MONDAY 8/5/17 PROGRAMME view below / smartphone download HERE. Click on "arrows expanding a square" icon: bottom RIGHT (as you scroll down). This presents a clear, LARGE display - But beware unexpected adverts also there - in ......FULL SCREEN. Do participate with us !﻿ - A wonderful, special day with a relaxed chat over lunch..
Take advantage of Monday as the BEST quiet day to really get to know Nel and her dances. 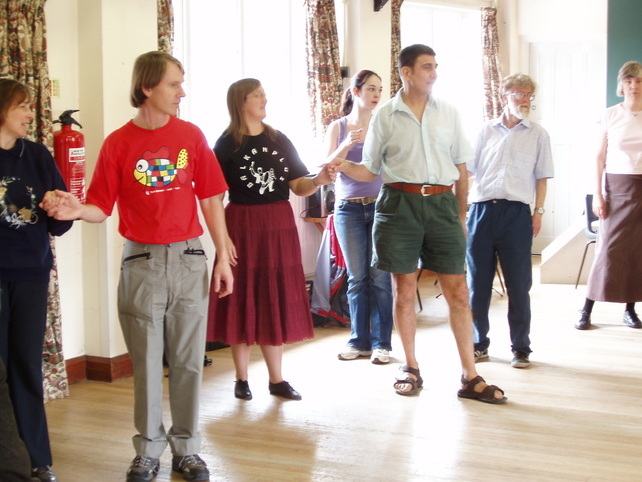 SAMPLE WHAT WE DO - lots of varied dancing, handbells, walking & more. Monday 8th May PLAN IT - LOOK AHEAD NOW - Take a break with us. Why this working Monday in May? 1) Specialist dancing for YOU. 2) Space to enjoy the Hall. And chat time over lunch too. 4) Bluebells in 2010 '11 & 2013 - were hardly open for our event. The outstandingly beautiful bluebell spectacle and scent WAS there for 2012, 2014 &'15 - A lovely April wildflower show. Partake in May this year, to look forward to a fully open bluebell spectacle. A Spring experience not to miss. It would be good to see more people enjoying Monday with our smaller group of dancers and walkers. More space to try those dances.